Not to confuse with the View-Point when both can become one. As written in the earlier post, the view-point is your final destination on your drawing, your journey’s end. We know that it is there, far away, on the horizon’s infinity. Your drawing, a metaphoric page of your life, represents a fraction of a second. What is below this real page is the past; on this page lies your future; on its very bottom edge, the “now”, the hic e nunc (the here and now). When dealing with a one view-point perspective, the vanishing points are technically points where vanish parallel lines in space. In some cases, the vanishing point can deposit itself on the view-point. An example of this superposition would be the notorious highway representation. On this above photograph, we all know that in a distance, a future moment, the highway goes up; you have to imagine that you will arrive at the beginning of the climb (the foot of the hill). A vanishing point in the sky will be therefore needed to represent the illusion of the climb. But you cannot go up to the infinity; we live on the earth. At the very top of the hill, you will undoubtedly start your descent. Therefore a vanishing point is needed below the horizon line to draw this illusion. Finally, you will arrive on the flat earth, and then your view-point will reappear on the horizon line. But to not forget, that momentarily, the vanishing point became your view-point. In the case of drawing a curvy road in perspective, vanishing points are needed for each direction the road you will be undertaking. When drawing, you have to imagine that in the very near future, a curve on the right or on the life will have to be taken (if you decide to stay on the road). If the road curves to the right, we need to put a vanishing point to the right; the same applies to the left. 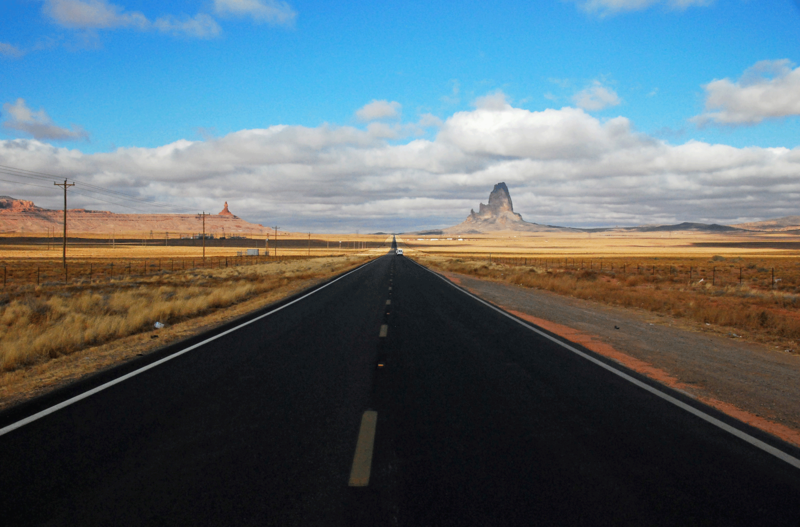 It means that you have to imagine that in the near future, the vanishing point is momentarily your view-point. But when all the curves of your life will be accomplished, back again on your destination of the page. In brief, the vanishing points are construction points making sure that parallel lines in space are well represented. Nonetheless, the view-point always remains on the line, even if it is far away beyond and behind the mountain range; remember that it is your final destination far away in space and time. What is closer to you and at this very moment, is just above the edge of the paper. The vanishing points inhabiting your pictorial space may be considered as various view-points of life. As I said before, they may become momentarily a view-point. The closer to the horizon line are these vanishing points or view-point, the further it is; what is very far is placed on the horizon line. It is in a way your absolute. On the sinuous road exercise, if you keep imagining yourself walking, you will start curving toward the right and of course, looking at the vanishing-point which becomes now your view-point. And in the distant, you acknowledged that in a few moments, you will be facing another view-point, which is the left vanishing point. But you also know that you are always walking toward your distant destination. Never forget that a drawing or a painting is only an infinitesimal fraction of your life. In a split-second your eyes looked at a myriad of construction vanishing points and so your analytic brain made sure that you stay solidly on your trajectory for your final destination. 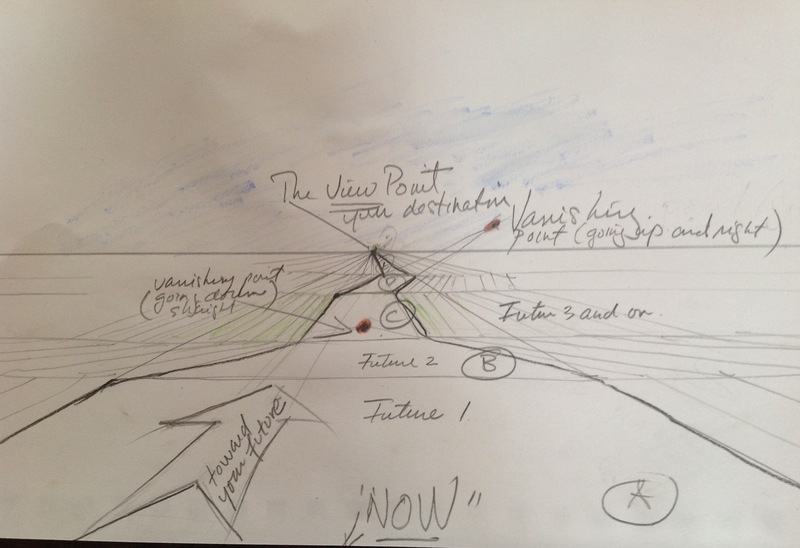 Never forget that your view-point is solidly anchored on your horizon line, your chosen journey, your future drawing, and your future photograph.